Fans were lined out the doors of Fleming Field House on the campus of Jefferson City High School on Wednesday long before the start of the boys final in the Great 8 Classic. 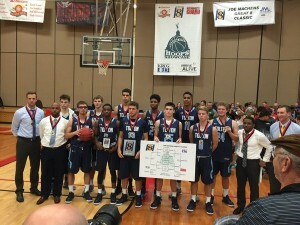 Michael Porter Jr. and the Father Tolton Trailblazers of Columbia faced Helias Catholic in the finals of the Great 8 Classic. Prep basketball fans were there to see what promised to be another close matchup between these two schools, but they were also there to get another glimpse of greatness from the third ranked junior in the country. They were not disappointed. Porter Jr. led with game highs of 20 points and 13 rebounds. Tolton was up 45-40 in the fourth quarter, when the Crusaders rallied to take the lead at 48-47 with 3:48 to play. Porter finished off a three-point play with a free throw after a contorted layup drew a foul, putting the Blazers up 51-49. Helias tied it up at 51-all on a pair of free throws, moments before Porter delivered the heroics. Tolton set up for the last shot and Porter’s three-pointer with 2.5 seconds left over two defenders gave Tolton the 54-51 win. Helias coach Josh Buffington said they couldn’t have defended the play any better and called Porter “a phenomenal player,” who just made a great play to win it. After the game, Porter said this game winning shot was one of the biggest of his high school career.